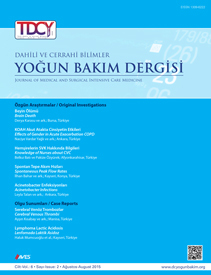 Objective: This study aimed to retrospectively analyze brain death cases that were detected at the intensive care unit of our hospital in the last seven years. Material and Methods: We examined archival records of patients who were diagnosed with brain death between 01.04.2007 and 01.03.2014. Demographic characteristics, diagnoses, brain death detection time, additional tests performed, the family’s organ donation rate, and the removed organ rate were recorded. Results: During the study period, 79 patients were diagnosed with brain death. The mean age of the patients was 40.65 (1–80) years. Intensive care advent of cases was examined, and it was observed that 60% of patients (n=48) arrived from the emergency department. Patients were divided into five groups regarding their admission diagnosis. It was determined that in most cases, brain death occurs after intracranial hemorrhage (59.5%). Apnea tests were attempted in all cases; however, it was observed that apnea tests could not be completed in four patients. In 30.4% of patients (n=23), in order to support the diagnosis of brain death, radiological methods were performed. Transcranial Doppler ultrasonography was performed in 11 cases (13%), cranial magnetic resonance angiography in 11 cases (13%), and both these imaging methods in one case. For patients diagnosed with brain death, 34.2% (n=27) of families agreed for donation; however only 81.48% of them became actual donors. The duration from admission to the intensive care unit to the initiation of brain death tests was one week in 86% of patients (n=68). The completion time of brain death tests was one day in 43% (n=34), two days in 29% (n=23), and three days or more in 27% of patients (n=22). Conclusion: Possibility of progression to brain death in patients with Glasgow coma scale below seven should be kept in mind at all times. The clinical diagnosis of brain death should be made as soon as possible. The significance of organ donation should be emphasized by an experienced and trained organ transplant coordinator during discussions with the family and increased rates of organ donation should be encouraged.